Here are two Easter Eggs I have completed. They are from Kristen Wind Hansen's Tatted Easter Eggs book. I am working on one more and will post it as soon as I finish it. This helps me get closer to my 25 motifs. With the two I will now have 17 completed. These are also for the challenge on InTatters. The challenge is to tat the same pattern in as many colors as you can. So far I have two. I think I will make more of this pattern but in a solid color. I have lot of Lizabeth threads to try out. All of these of are done in Lizabeth threads. I am going to give them to my step mother to hang on the door so the birds don't hit the glass. Right now she has black electrical tap in an "X" on the window. Don't you think the Easter Eggs will be much prettier? Boy, working sure does affect the time I have to tat. I am not liking that at all. Friday our computers were down until noon. I was wishing I had a shuttle with me. But I was in luck as my friend was in town and she picked up a shuttle and some tread for me. I was able to start something but the tech guys showed up and fix our problem so it was back to work . When my friend called I asked her to get me a plastic shuttle and some thread. However, she purchased a metal shuttle with a bobbin, think that I would like that one better. So I finally tried a shuttle with a bobbin. I am not sure that I like it, but I do understand the convenience of one as you don't have to unwind your shuttle when you are working. I might get used to one but I don't think so. I have lots of little plastic clovers that I love to work with. I will save this one in my purse so I always have one on hand no matter where I am. Nice thread! 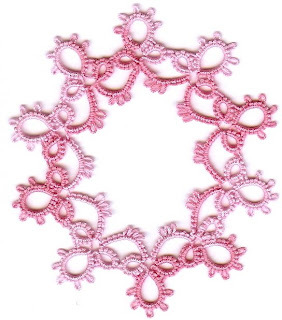 Pretty motifs, too! Bobbin shuttles are my very favorite to work with. Perhaps a plastic bobbin shuttle might suit you better than metal one? Sometimes the metal bobbins rubbing against the metal shuttle creates a black 'dust' that gets on the thread if your thread ever gets caught between the shuttle and the bobbin. It then turns the thread black at that spot. 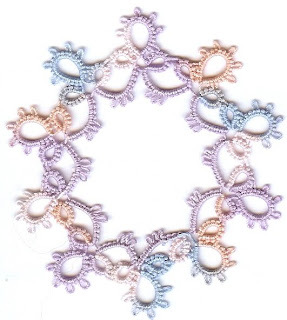 The motifs are very pretty, and so are the colors you used to make them. Very nice! May I suggest an Altoid tin? Or something about that size. It works well to keep your shuttle and maybe an extra bobbin or two safe as they rattle around in your pocket/bag/tote.